Sometimes we have to take a step back for the whole picture. It was a heavily clouded day but still a bit of hope for an unspoiled view from the top. In my rucksack I carried a light burden: a framed photo of my best friend ever. He had been a top executive trainer and had worked successfully for big corporations, he had been highly intelligent, wise, a gifted storyteller and comedian with a slight deviation to sarcasm. Standing almost 7 feet tall and with a black moustache he was the Dutch version of John Cleese. But he could also have terrible tempers, even fits of rage and he could be overwhelmingly generous. In short: he suffered from manic-depression. For me he had been like a mountain: impressive, rewarding and yet unpredictable. He had an Achilles heel: a massive status anxiety. The higher he climbed in corporate circles the more he wanted to be one of ‘them’. The wonderful teacher he had been in his early years, had become a ‘name dropper’ who started to take risks as a businessman, became hypnotized by societal recognition and went bankrupt. But our friendship lasted, even when I opposed his ill-fated ambitions. Cancer knocked him out in the second try. In between he asked me if I would take him to the highlands of Scotland after he had recovered. He wanted to see the landscapes and mountains I had described him so often, he wanted to experience the simple and rewarding pleasure of walking. It never happened. So I walked up Ben Wyvis with the framed photo. I always had wanted to show him the freedom of hiking, a bit of strain, the comfort of silence, the views from the top, new perspectives, endless space and possibilities. Not the controlled beauty of a golf course. It was a beautiful hike to the top but while I climbed it became more and more cloudy up there. 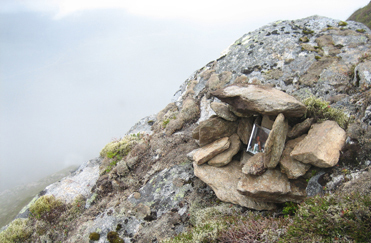 At the border of cloudless and cloud I started to collect rocks and built a small shrine for my giant of a friend. It was big enough for the photo. A photo of us together, in a fit of laughter as so often, probably about ourselves, our vanities, pompousness or philistinism. I let him watch a valley opposite that opens towards the west so he could follow the setting sun as long as possible. To the right a view towards a friendly smaller mountain. I wished that he – his soul, his molecules – would enjoy the view. How many invisible parts of my friend were looking over my shoulder right then? I looked up. The cloud didn’t look attractive. Should I continue up, like a Scotsman would do? They always seem to ‘keep on walking’, view or no view. Walk for the sake of walking, breathe for the sake of breathing, sweat for the sake of sweating and still enjoy. Not necessarily looking for a view. But I could get lost up there, trying. I had never walked Ben Wyvis before. As I did not know what to expect in the mist, I decided to extend my photo wake a little longer. I took some photos of the shrine to make my trip real for others, too. A proof, probably redundant. Our combined memories are much more valuable. I looked up again. The cloud had started to move towards me. This day this particular mountain was not benign and I accepted its refusal. Sometimes we have to hold back aspirations and wait for the right moment. We won’t be able to predict that, but we can prepare ourselves for it. Mountains are unpredictable, it’s their nature. Like it was my friend’s nature. I had learned to accept that. And yet, maybe he would have learned something here – in the highlands – about himself and maybe the experience would have put his life in another perspective. Maybe the mountain would have taught the mountain a different reality to live by. I left him behind and started to descend. The landscape before me had changed.